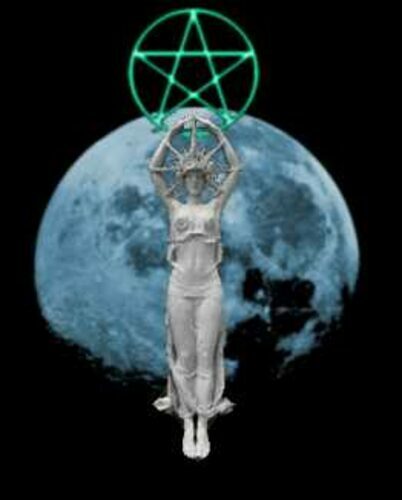 Whenever you have need of any thing, once in the month and better it be when the moon is full, then shall ye assemble in some secret place and adore the spirit of me, who am Queen of all witches. There shall ye assemble, ye who are fain to learn all sorcery, yet have not won its deepest secrets; to these will I teach things that are yet unknown. And ye shall be free from slavery: and as a sign that ye be really free, ye shall be naked in your rites; and ye shall dance, sing, feast, make music and love, all in my praise. For mine is the ecstasy of the spirit, and mine also is joy on earth; for my law is love unto all beings. Keep pure your highest ideal; strive ever towards it; let naught sop you or turn you aside. For mine is the secret door which opens upon the land of Youth, and mine is the cup of the wine of life, and the Cauldron of Cerridwen, which is the Holy Grail of immortality. I am the gracious Goddess, who gives the light of joy unto the heart of man. Upon earth, I give the knowledge of the spirit eternal. And beyond death, I give peace, and freedom, and reunion with those who have gone before. Nor do I demand sacrifice; for behold, I am the Mother of all living, and my love is poured out upon the earth. Hear ye the words of the Star Goddess; She in the dust of whose feet are the hosts of heaven, and whose body encircles the universe. I who am the beauty of the green earth, and the white Moon among the stars, and the mystery of the waters, and the desire of the heart of man, call unto thy soul. Arise and come unto me. For I am the soul of nature, who gives life to the universe. From me all things proceed, and unto me all things must return; and before my face, beloved of Gods and of men, let thine innermost divine self be enfolded in the rapture of the infinite. Let my worship be within the heart that rejoices, for behold, all acts of love and pleasure are my rituals. And therefore let there be beauty and strength, power and compassion, honour and humility, mirth and reverence within you. And you who think to seek for me, know thy seeking and yearning shall avail you not, unless you know the mystery; that is that which you seek you find not within thee, you will never find it without thee. For behold, I have been with thee from the beginning; and I am that which is attained at the end of desire.